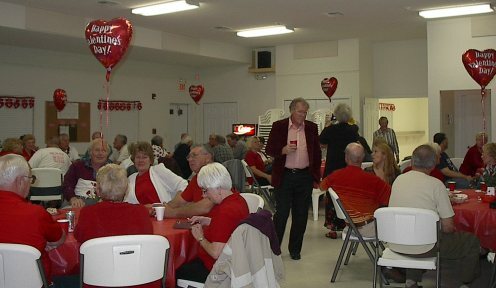 The purpose of the Activities Committee of the Gulfcoast Homing Club is to sponsor social functions at the clubhouse that will bring the members, their family and friends together outside the scope of flying pigeons and to raise funds to purchase items that will enhance the use of the GHC Clubhouse. In 2003 the idea was presented by Tony Soulis to the past GHC President, Jerry McIntosh , and approved by the GHC Board. Tony the committee chairperson, also addressed the GHC membership at the January 2004 meeting and got no objection. Currently, the Activities Committee consists of three members from the GHC and three members from the Ladies Auxiliary. Together the committee members collaborate and plan social events that might be fun throughout the year. The Committee always welcomes different ideas for club activities but the person(s) who makes the suggestion must be willing to plan the event and get help to execute it. Members of the committee will be available to assist if necessary. The Activities Committee does not directly receive funds from either the GHC or Ladies Auxiliary. Each event has been funded by donations and/or charging a minimal fee. The 32in. TV in the dining area was purchased with donated funds from Steve and Toni McNeil of Canada, Connie Revoir donated the electronic message board, Jim Revoir donated a large cooler, Art Hees has donated his trophy money annually since the Committee was organized, the 2004 Classic committee paid for the VCR/DVD player, and Tony Frontiero built permanent shelving for the televisions. Any money raised through these events goes to purchase items for the GHC Clubhouse and pay for additional cleaning services following an event. The first major purchase was a 60 in. TV for the shipping area. This item eliminated having to borrow a television for certain events and is now there for everyday use. Other items purchased have been two coolers, a chest freezer, drapes in the shipping room, and sound absorbers in both the shipping area and dining room. It is the hope of the Activities Committee that flyers and families of the GHC will strongly support the events sponsored by this Committee.